I don’t bake. Actually I should say that I don’t bake well. Salt gets forgotten, butter gets neglected to get to room temperature, or my personal favorite was my choice to use a removable bottom cake pan when making my grandmother’s gooey biscuit cake (think monkey bread), and I open the oven to find all the yummy brown sugary syrup had oozed on out of that pan and formed a hard slick on the bottom of my oven. So it is ironic that my first post is of a cake. However, as I stated in my ‘about‘ page, I like to challenge myself. Chalk it up to being stubborn. So memories of dry cookies and purple-green blueberry muffins banished, I decided I was going to try this recipe. I tore it out of the Bon Appetit October 2012 issue because…oh hell, just look at it. It’s like a perfect storm of all good ingredients. So armed with a Stuart Smalley-like mantra of ‘I can do this’, I dove into making this cake. A short word on a few changes I made – one deliberate and one not. One – I used regular sized chocolate chips as that is what I had in my cabinet, and two – I used two round cake pans because I didn’t read the recipe all the way through. Classic Erin. Preheat oven to 350. Coat cake pans with non-stick spray. Line bottom of pans with parchment and coat with non-stick spray (although I skipped the paper step). Whisk flour, baking soda and salt in a medium bowl. Using an electric mixer, beat the sugar, butter and brown sugar in a large bowl until light and fluffy, about 3 minutes. Add eggs one at a time, beating to blend between additions. 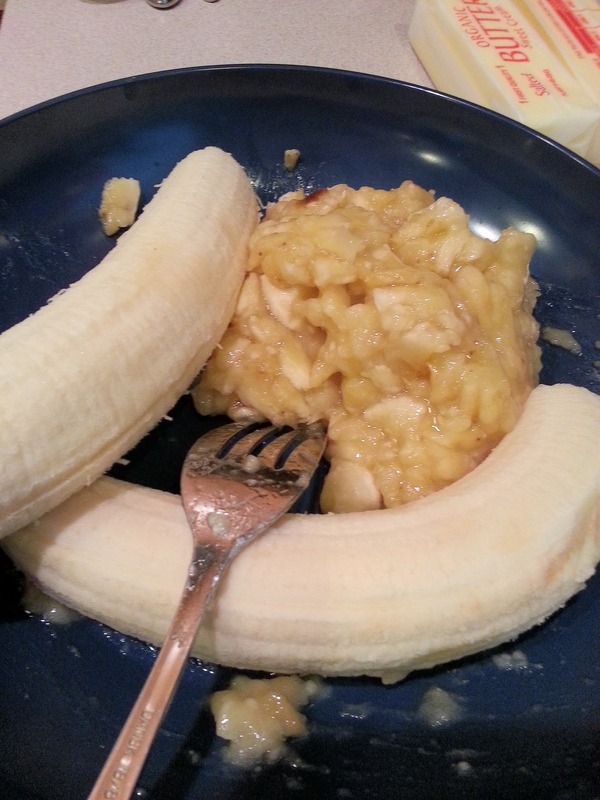 Occasionally scrape down sides and bottom of bowl to fully blend. Beat in vanilla. Bake cakes until a toothpick inserted into the center comes out clean, about 35 minutes. (I had to add 10 more minutes because of my larger pans). Transfer to a wire rack; let cool in pans for 10 minutes. Invert cakes onto racks to completely cool. Peel off parchment if you chose to use. Using an electric mixer, beat first four ingredients in a medium bowl until a light and fluffy frosting forms, 2-3 minutes. Place one cake on a plate. Spread 1 1/4 cups frosting evenly over the top of the cake. Place remaining cake on top with flat side (bottom) facing up. Cover top and sides of cake with remaining frosting. Garnish with chocolate chips however you see fit! You can spell something, do a design, or just leave it random. Cake can be made 2 days ahead. Cover and chill. Let stand at room temperature 1 hour before serving. (My kids complained that the frosting was hard when serving a slice right from the fridge..boo hoo). 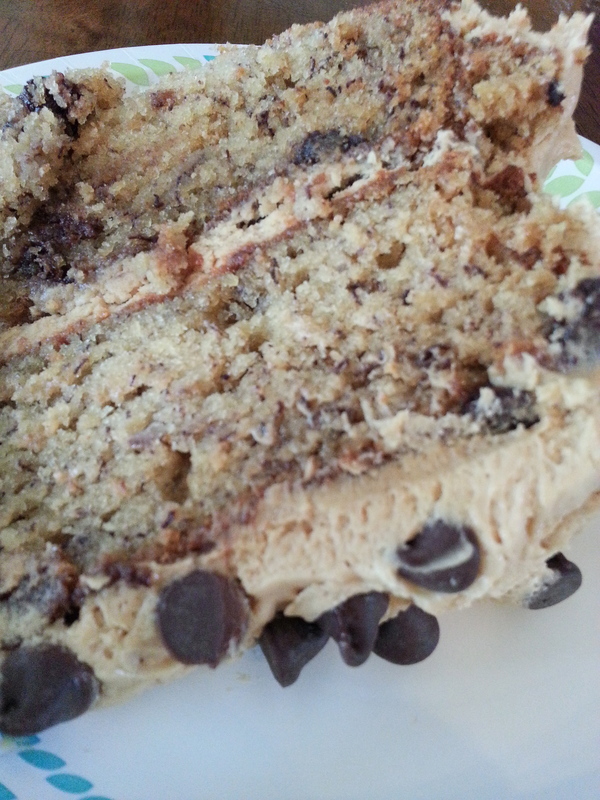 This entry was posted in desserts and tagged banana, cake, chocolate chips, frosting, peanut butter. Bookmark the permalink. I tried this recipe and it was delicious!! Banana cake with a twist…peanut butter and chocolate…always a perfect combination!! How come I didn’t get a piece? haha! I just gained 5 lbs looking at this. That was the five lbs of clams, mussels and mahi mahi you ate…oh and that beautiful bowl….